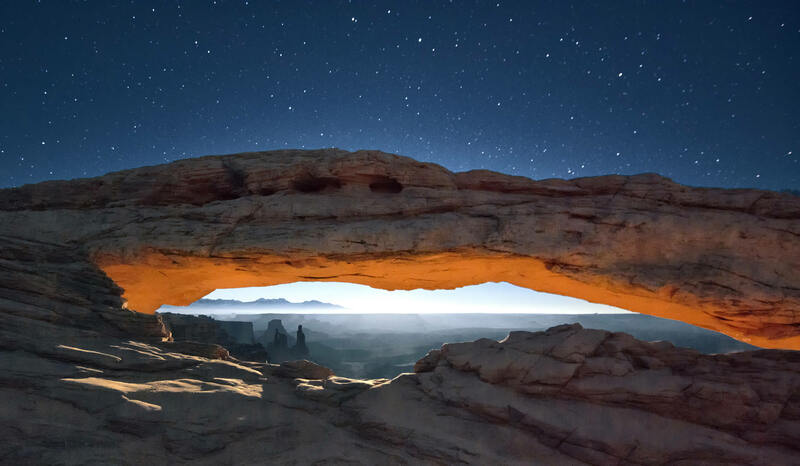 Directions: One of the most photographed locations in Utah, Mesa Arch is located in the Island in the Sky district of Canyonlands National Park. A few miles past the visitor center, there is a signed parking area with a short (1/4 mile) trail leading to the arch. The arch lights up spectacularly at sunrise. It's about a 45 minute drive from Moab to the arch. Allow an hour for hiking and setting up. Bring an extreme wide-angle lens because you will be close to the arch. You’ll also need a tripod and a remote release for camera stability. Bracket several photos because your light meter probably won’t work well for automatic exposures. And don’t forget to bring a flashlight. It is difficult to keep Intelligence ~ at bay . . . H a !